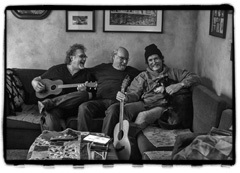 Grammy Lifetime Achievement Award-winner and folk icon Tom Paxton teams up with the Grammy-winning singer/songwriter duo The Don Juans, Don Henry and Jon Vezner. Collectively, their songs have been covered by Harry Belafonte, John Mellencamp, Miranda Lambert, Neil Diamond, Ray Charles, Nancy Griffith, Judy Collins, Pete Seeger, Janis Ian, Kathy Mattea, John Denver, Faith Hill, B.J. Thomas, Blake Shelton, Peter, Paul & Mary and Bob Dylan … just to name a few. Within days of writing and playing together, they knew they were on to something. Now they’re taking it on the road! Tom Paxton's (guitar/vocals/stories) career has taken him from his days as a drama student at The University of Oklahoma to thousands of concerts in a variety of venues––from coffeehouses in Greenwich Village to The Albert Hall in London to Carnegie Hall in New York; from festivals in Hong Kong to Denmark, from Tokyo to Oslo. He has recorded more than 50 albums of his own songs; recordings of his songs by other artists number in the hundreds. Nashville-based Jon Vezner (piano/vocals/guitar/uke/kitchen sink) is a tunesmith of rare sensitivity and dry wit. His catalog of recorded songs, topped by the poignant “Where’ve You Been” (winner of the 1990 Grammy for Best Country Son and the Nashville Songwriters Association's Song of the Year), reflects his straight-to-the-heart sensibility and emotional awareness. Vezner weaves the particulars of his own feelings with the lives of people he has known into universal themes that deeply touch listeners’ emotions. Don Henry (guitar/vocals/uke/banjo/grins) was inspired by some of the finest singer-songwriters of the 1970s. Making his way to Nashville as a 19-year-old, he spent four years as the tape copy/librarian for Tree Publishing Company, cataloging some of the best songs by some of the best songwriters in Nashville. Before long, Don's own songs started getting recorded and he was moved to full-time staff songwriter. In 1990, Don and Jon received song of the year awards for co-writing Kathy Mattea's critically acclaimed hit, "Where've You Been." Awards from the Grammys, as well as from the Academy of Country Music, the Country Music Association and the Nashville Songwriters Association International culminated in "Where've You Been" becoming the first song ever to be so honored by all four organizations.